Mahatma Gandhi's ardent follower Rajat Sharma found searching on the internet Gandhiji's quotes on killing mosquitoes is non violent act. "I am searching on the internet whether Gandhiji wrote or said something on mosquitoes. I am his ardent follower and can't slap a mosquito without his permission," said Rajat Sharma who is working for a reputed TV Channel. 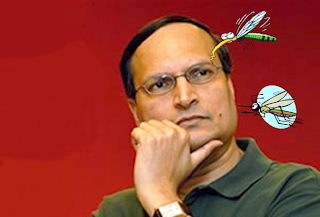 Rajat Sharma is facing a severe irritation and annoyance caused by a mosquito which is consistently sits on his face and bites him badly. "I face a lot of pain. But just it would be a violent act I avoid myself to take any kind of revenge. Otherwise I believe I must have that much power to kill one mosquito," said Rajat Sharma. Rajat Sharma's doctor Vishnu Venugopal said "That is because Rajat applies huge amount of coconut oil and mosquitoes come on his face out of the sheer light reflection. The oil is so much on his head to keep it black and shining that mosquito arrives in closed studio. Rajat has also ordered his staff not to kill the mosquito as he believes in non violence." Venugopal said "It is because Rajat's promise to Gandhiwad he is not able to slap that mosquito hard and kill it once and for all." Rajat Sharma's successful adoption of Gandhiwad, who even doesn't allow himself killing mosquitoes raised serious debates on the news channels whether he should adopt everything that Gandhiji said or partially. Many News Channels also questioned Congress Party leaders where they stand today. Are they standing on the same foundations of non violence that led by Gandhiji's principles or they kill mosquitoes? Coal Minister, Beni Prasad Verma said "Till the time I was with Samajwadi Party I used to kill 40-50 mosquitoes daily. However, since I joined Congress Party I never ever killed a mosquito despite its sting hurts a lot. That is the reason why I told Afzal Guru should not be hanged." Few more Congress leaders also confirmed that they don't kill mosquitoes just because they follow non-violence. "I think we should be friendly with mosquitoes. If we make them friends they wouldn’t hurt us. Look at Pakistan we made it friend so it wouldn’t send terrorists to our country again and again," said Senior Congress leader Digvijay Singh. Digvijay Singh confirmed that he never killed any mosquito till date, since his birth. "Since I borne, I was Congress leader. There was no doubt about that. Therefore, even my blood has the foundation of non-violence. I feel it is like mosquito is kissing me rather than biting," said Digvijay Singh. BJP leaders, however, denied that they never slapped any mosquito. "No I usually do that. Since right now my position is not good I would not make any comment," said BJP President Nitin Gadkari. The topic was discussed in the mainstream media whether do we found an ardent follower of Gandhiji like Rajat Sharma on the earth. "I think Rajat should put a helmet on his head which also covers face and then take interviews," said Rajdeep Sardesai CNN IBN Chief Editor. He said "I think people should follow Rajat's footsteps so that we may see a great revolution in our country." Rajdeep also questioned authenticity of present Congress Party which always use to preach that it is the only party in the world that follows Gandhiji's principles. Rajdeep questions "Are Congress leaders still follow all principles of Mahatma Gandhi? Do they stop themselves from killing innocent mosquito? I want to ask them a question if a common man and chillar Hindi News Channel Editor like Rajat Sharma can adopt principles of Gandhiji why not we. Why not Congress Party leaders?" He said "Our channel is the first that made a survey on whether Congress leaders kills mosquitoes or not. 100% leaders said in public that they let all mosquitoes sit on their parts of body exposed to air and light. They also ask mosquitoes to sting hard and let the blood come out of it. However, in private all of them confirmed that they use a tight slap on the mosquito. Now it is my question whether the public should elect these hypocrite leaders."